swirls, spirals, and exotic blooms spill out of this tiny and elaborately embellished bottle. what mysteries are waiting to draw you in? If you are so inclined you can visit my website for updates. 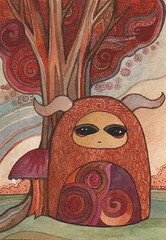 I've added quite a few newer Forest Creatures, and updated my Biography / Artist's Statement..
i am so tired today, i wish i could think of something deep and witty to say. i think it might be allergies. 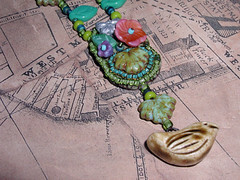 at least i am not allergic to glass flowers and leaves, as seen here in the secret garden necklace. this necklace features the beautiful wren-colored porcelain songbird bead from Earthenwood along with glass flower, leaf, and butterfly beads. I've listed it and some of my other beaded necklaces on etsy. My necklaces are always one-of-a-kind, usually designed sort of as I go. Now, if you look close, there is a pewter bunny hiding here! I remember Easter on the farm. My sister and I each had pet bunnies. She had 2 grey bunnies named Angela and Opal, and I had a white bunny named Soapy -- young children being so creative in the naming department -- and a grey and brown bunny named Charlie. Charlie was my particular favorite. They were angora bunnies, so much careful brushing was required. I used to like to let Charlie hop around the yard a bit. He absolutely adored dandelions -- even more than carrots - and no one minds having a dandelion destroyer about the lawn, don't you know? I seem to remember my mother always giving us watercolor paint-boxes in our Easter baskets. Maybe this only happened once or twice, I don't know, but I seem to remember it vividly! Also being sent out to find where the free-range hens were hiding their eggs that week. You'd locate a cache of maybe 10--15 eggs, laid by several hens over some unknown length of time.. you probably would not eat those, not knowing how old they were, but you'd take them away. the hens, being among God's most intelligent creations, would continue to lay their for a while and you'd collect their eggs daily. Eventually they would realize someone was stealing their eggs and they'd find a new spot and you'd repeat the whole process. Our hens laid brown eggs. The one time of the year when my mother would buy eggs at the store was Easter, because white eggs dye much better than brown eggs! Some hens lay colored eggs, light blue and green and so on. I always wanted to get some of those chickens! As I recall we had Rhode Island Reds. 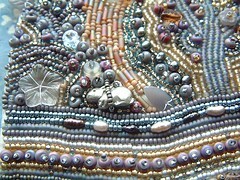 I've been working on some beaded necklaces the last few days, using some of the special beads I've hoarded. This necklace includes pressed glass beads and seed beads and copper charms. 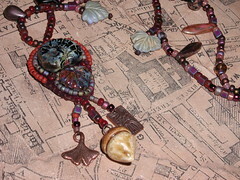 The acorn is something i am especially fond of, it pulled the whole necklaces together. It is from Earthenwood Studio. I highly recommend Earthenwood for beautiful beads and great customer service! I was quite happy with how this came out. it's 8 x 10 inches. You can't tell from the can but the background is sort of a delicate shimmery bronze. It's on Etsy if you are interested. I did a lot (for me) yesterday and did not sleep terribly well so woke up kind of tired. So i did not do much today. Worked on a gift, knitted a bit, beaded a bit. I watched the mini series Voyage of the Unicorn. It's based on James Christensen's book, Voyage of the Basset. It was cute but I had hoped for better. The book is really amazing. The miniseries was done by some of the same people who did a sort of fairytale-esque miniseries called The Tenth Kingdom, which was quite good so I had hoped for more. But it is something one would not mind your kids seeing - same with The Tenth Kingdom - so that's always good. And I watched the 1st two episodes of Jonathan Creek and I quite liked that. I don't watch DVDs that much lately, I have been more into audio books. My life seemed more eventful when I was working-- even though I did not blog about work much and did not do too much else beyond that. Well, today I sent out 2 resumes and applied for an online job, went to the post office, library, and grocery store, got some tea, and sat in the sun for a bit. Then I did the scary thing and went to my former place of employment to retrieve my personal items that my former coworkers had packed up for me. I am glad that i was forced to clean out everything last year when it flooded, but i still had a lot of things there! But after 15 years you would expect that. A friend gave me a ride and that made it easier in more ways than one. I read some (Spirits in the Wires by Charles De Lint) and listening to an audio book for a while (My Man Jeeves by P.G. Wodehouse), and I did some painting. I feel a bit lonely and restless sometimes. Oh, yes! 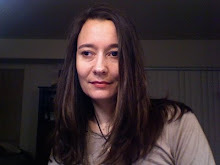 I did chat with my twin sister who is on a trip to Siberia right now. An awful lot of what is online is just a waste but there is some amazing technology too! well gosh. i have been trying to update regularly but my life seems to have gotten rather dull. not like i talked about work all the time before, but i feel like i am in limbo now! but i have been painting anyway. 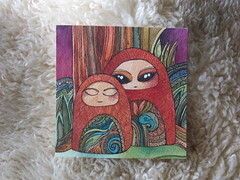 this is a new one, small and sweet, just 4 x 4". 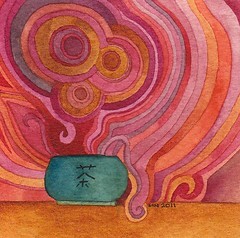 the kanji for tea is written on the cup. i've listed it and some others on etsy. i think this one would make a nice little gift with some special tea. i do love tea. i've been drinking red tea lately, for the most part, and a little pg tips. 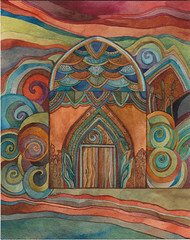 here is another new painting in the minaret series. i'm being drawn to work larger and larger - though i know many would not consider 11 x 14 to be large! it is for me. 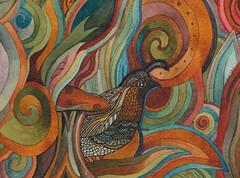 this is watercolor and ink on watercolor paper. 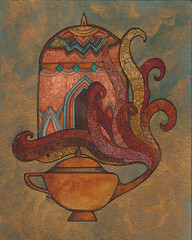 i had the notion of a temple rising out of tea steam - i imagine i'll keep exploring this idea or a while, i am still drawn to it. 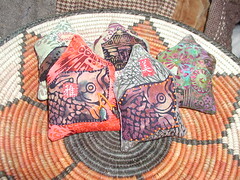 i made these lavender sachets last week when i was playing around with fabric. teeny little houses! they are assemble by machine but the applique and beadwork etc. is all done by hand. i have not decided yet if i will offer some for sale or maybe just keep them or use as gifts! my condo smells like lavender now - not a bad thing! i got a new-to-me-camera, from a friend who has upgraded. i am so thankful i can take pictures of my art again! 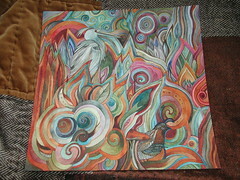 this painting is 12 x 12" and too big for my scanner. i am working on another large one as well and may finish it today. i keep coming back to birds! 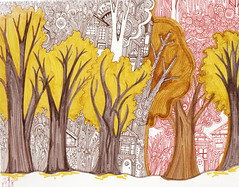 Well, I can't seem to stay away from Autumn colors, even in Spring. At least I HEAR it is Spring. Actually it was pretty nice in Seattle today. I sat outside with my friend Janusz for a while, drinking an iced mocha, while waiting for a hose on my vacuum cleaner to be replaced. It made me pretty happy that it was only $20 and they did not charge me for labor. I like fixing things instead of buying new things! I just sent out 2 resumes. Working on resumes and cover letters is pretty emotionally exhausting. I think I will either paint or read now to relax. I am working on a bigger painting - 11 x 14" -- well, it's big for me and it's big for watercolor. For me, since I always want to go crazy with detail. yesterday was one of those days when i try to paint and it does not come together. but i was able to draw a bit in my sketch journal. i went to the ballard sunday farmer's market and wandered around a bit, had a cup of tea, looked at art in one of the local galleries, and got in some people time. i get too hermishish otherwise. i do not think that is a real word but i am using it anyway. today i am working on resume etc and hope to later go to a knitting meet-up. i wish i had more exciting news to report but i think a picture is worth 1000 words, yes? 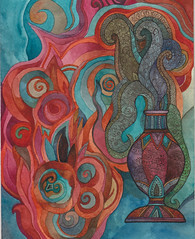 I finished this painting yesterday.. another one in the "Minaret" series. I am very happy with how it came out. It is listed on etsy if you are interested. I did not leave the house yesterday, which was not so good! 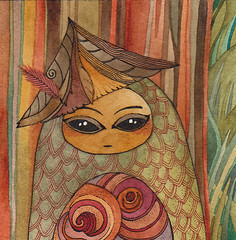 Today I think I am going to go to the sunday market and get a cup of tea or coffee someplace and sit and draw! well, it's been at least a week since i posted anything here. I just have not been able to get myself to. I was one of a group of people laid off by my company last week. After having worked there for 15 years it came as a shock. I had thought I would be there until I retired. I think it will take me some time to get over the shock and adjust to this major change in my life. I have worked on my resume and send some out. I am looking into other ways to make a living, or at least part of a living, with my art. I am trying to just carry on and not shut myself up like the hermit I tend to be. This is a painting I've worked on this week. I am very happy with how it came out. 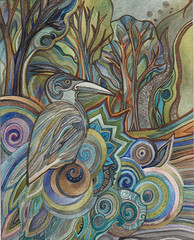 I always loved seeing Herons on Vashon Island, where I grew up. 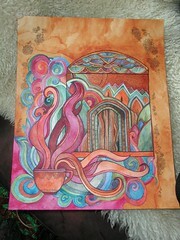 This painting is available on etsy if you are interested. 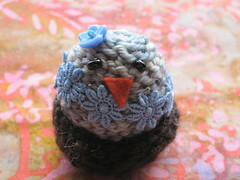 i have little Easter Chickies on Etsy if you are interested! this little dear is about the size of a walnut. she would be a lovely addition to your spring time decor. She is not suitable for tiny children, but I will be adding some Easter creatures that small children can enjoy in a few days.